2017 was challenging for Moong Pattana International Public Company Limited with Thailand’s economy growing along with that of the World while the spending of the public sector being on the cautious side with its growth not growing as much despite the government’s attempt to stimulate household spending through various approaches including tax benefits and promotion of domestic tourism along with the never-faded grief upon the passing of His Majesty King Bhumibol Adulyadej, the beloved Late King of Thai citizens. Nevertheless, the Company’s board of directors, executives, and employees wholeheartedly and persistently continued to grow the business and sustainable return to the equity holders and operate to meet the expectations of the customers, partners, and all stakeholders, contributing to the Company posting THB 795.4 million in revenue from sale of goods , a 13% increase over 2016, and THB 77.3 million in total comprehensive income, both of which were accounted for the Company’s 9th consecutive year of growth since being listed in the MAI in 2009, reflecting the Company’s commitment to sustainably operate and grow the business. In addition to progressing the Company forward with continuous returns, the Company’s board of directors focused on their governance enhancement to international standard and operating the business based on Sufficient Economy Philosophy, the guidance by His Majesty King Bhumibol Adulyadej. 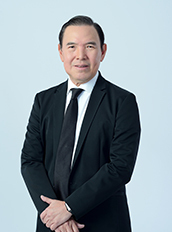 After the Securities and Exchange Commission of Thailand (SEC), announced Corporate Governance Code (CG Code) for Publicly Listed Companies being effective on the 17th of March, 2017, aiming for the companies to sustainably create value for their businesses, Moong Pattana International Public Co. Ltd. immediately adopted the CG Code into the organization and its corporate governance policy as the business operating principle since the 10th of August, 2017. Engaging in mobilizing Thailand toward Value-Based Economy, in 2018 the Company will continuingly uphold to growing with innovation in accordance to Thailand 4.0 policy by strengthening and enhancing its competing capabilities through technology, creativity, and innovation, allowing the employees to evolve their potential, and optimizing the operating process proficient in matching with the changing behaviors and needs of the customers in the digital age. On behalf of Moong Pattana, I thank the Company’s shareholders, partners, customers, and all stakeholders for the never-ending support and trust. I am firmly confident that the Company’s board of directors, executives, and employees will continuously, sustainably create value through shared responsibilities with the society, communities, and environment while delivering exceptional operating results.